The only thing pervading the atmosphere of Riot Fest Chicago more strongly than the searing 85-degree heat was an aggressively displayed, yet somehow earnest, punk rock mentality. The blistering sun did not deter hundreds of festival goers from dressing in black jeans, full suits, trench coats, and turning out what certainly must have been the highest flannel-per-square-foot concentration Douglas Park has seen since last year’s Riot Fest. However, between remarks from passersby like, “That’s the least punk thing I’ve ever heard. You’re turning into a yuppie,” and, “It’s not the counterculture if it’s just culture,” the crowds at the festival seemed overwhelmingly positive, laid-back and eager to enjoy themselves at some of the highlights of the weekend’s performances. Skating Polly’s Kelly Mayo at Riot Fest Friday. Image via Twitter.com/skatingpolly. Step-sisters Kelly Mayo and Peyton Bighorse brought two distinct vocal qualities and performance styles to the Friday afternoon set: Mayo’s uninhibited vocals accompanied high kicks and cross-eyed glares at the microphone that marked her intense, energetic stage presence, while Bighorse was more reserved but no less fierce with controlled vocals that often alternated between gritty shouts and airy, B-52s-esque trills. The energy only heightened throughout the performance, which ended as the bass guitar was played using a drumstick. 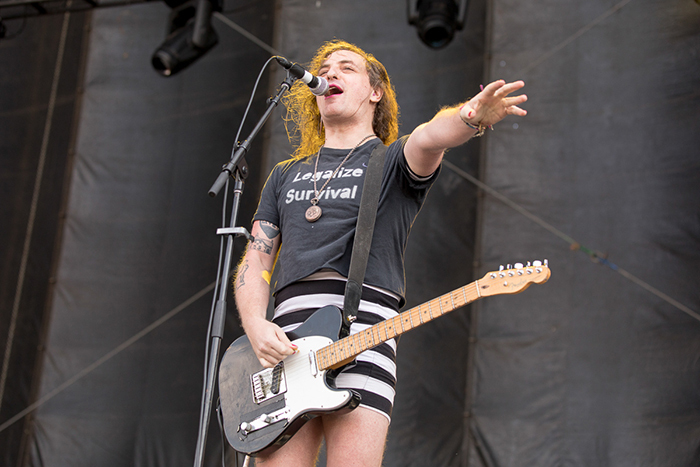 Vocalist and guitarist Mattie Canino of RVIVR Saturday at Riot Fest. Image via Setlist.fm. One of the happiest bands at Riot Fest, the juxtaposition of the loud, unrelenting shred of the electric guitar and sincere, positive lyrics of their songs, about which vocalist and guitarist Erica Freas said, “The next song is about love. Guess what? They all are!” made the Olympia, Washington-based punk band’s performance a standout. Lead vocalists Freas and Mattie Canino were beaming through the entire set as they promoted their political, queer-positive message both through lyrics and their remarks to the audience. RVIVR emanate the kind of driven optimism with a confidence that makes listeners think society just might still be moving forward. Potty Mouth vocalist Abby Weems performing at Riot Fest Saturday. Photo via Chicagoist. Potty Mouth’s deliberate yet tentative stage presence and their charmingly naive song “22” in which lead vocalist Abby Weems worries, “I don’t feel like I’ll be me if I can’t be 21″ emphasizes that the band are, in fact, quite young. This reminder, however, made their confident, polished-yet-punk instrumentals all the more impressive to hear. The mics were just a little too quiet to easily detect some of the witty lyrics, but the highlights from the set, including the catchy “Creeper Weed,” distinguished the band’s performance. Lydia Night and Sage Chavis of the Regrettes at Riot Fest Saturday. Image via Rebellious Magazine. One of Saturday’s rowdiest crowds was the audience for a retro-tinged, punk-pop band of high school-age teens. 16-year-old lead vocalist Lydia Night orchestrated a “wall of death” at the end of the band’s set, wherein she parted the crowd and instructed audience members to run at each other and mosh when the driving chorus of their final tune kicked in. Even more surprisingly, the participants in said wall spanned all ages, from kids as young as the band themselves to middle-aged men and women. The punk-pop band’s look and sound was tinged with “retro” elements, like guitarist Genessa Gariano’s cat-eye sunglasses and psychedelic-patterned dress, and Night’s peppy bounce across the stage to the three-part “ooos” and “aahs” in the song “A Living Human Girl” that mark the band’s upbeat, palatable sound. Bethany Cosentino of Best Coast at Riot Fest Sunday evening. Image via Riot Fest. Best Coast’s performance showcased how the L.A. band can pick one thing, go all in and do it well. Nearly every aspect of the set, from the heavy reverb, to the numerous lyrical odes to West Coast (“California nights make me feel so happy I could die”), to frontwoman Bethany Cosentino’s “hippie mom sentiment” that the audience be kind to one another, radiated California. Or at least, how a bunch of Midwestern teens having a ball and moshing even to their mellow, down-tempo songs, might envision California. Large, industrial-sized fans running at full blast at the front of the stage blew back Cosentino’s long, middle-parted hair and gave her an almost ethereal look as she and the band gave a feel-good, laid-back but shining performance.